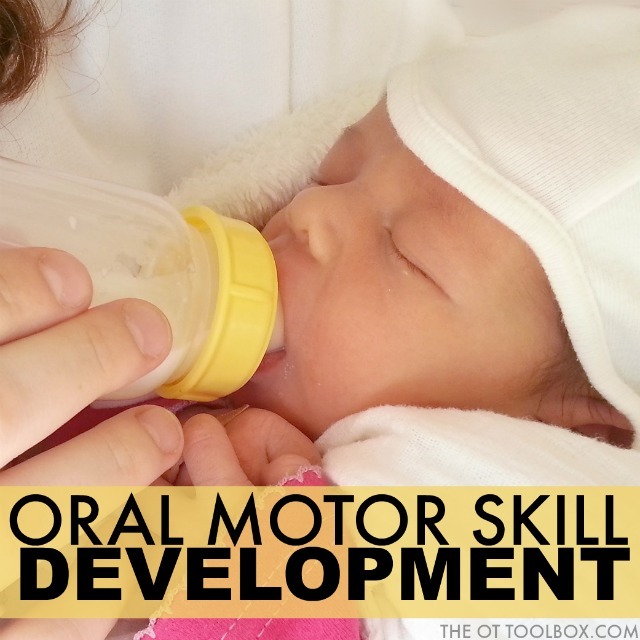 Wondering about oral motor skills development or where to start with oral motor therapy? 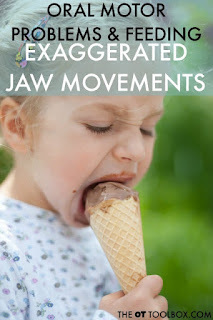 Below you will find information related to the development of oral motor skills. 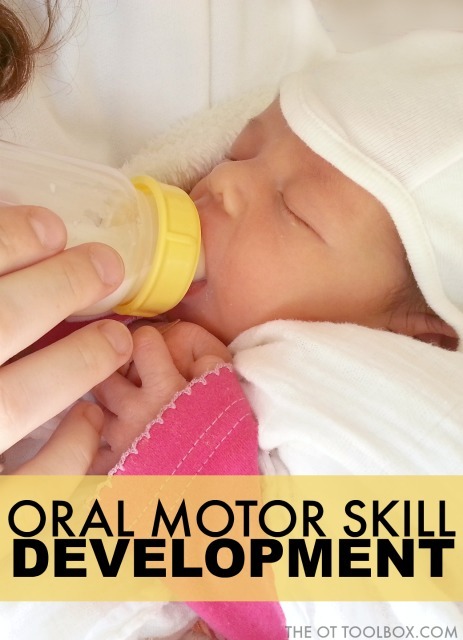 This oral motor development information can be used to guide oral motor exercises and oral motor skills for feeding. This article was written by The OT Toolbox contributor author, Kaylee Goodrich, OTR. Oral motor skills are the finest of the fine motor skills we develop as human beings. It begins in the womb, and is fully developed and established by 3 years of age. Like many other skills we learn, oral motor development is supported by primitive reflexes, postural control and other physiological milestones developing in synchrony. When the synchrony is broken, problems arise. Oral motor skills start in the womb with the development of primitive reflexes that support feeding at full term. It is important to note that these reflexes develop in the 3rd trimester between the 28th week and the 37th week gestation. When working with a pre-term baby, these reflexes have not developed and successful feeding will require higher levels of support from an outside source. A full term infant is ready to breast or bottle feed with the above supports in place. As reflexes begin to integrate, feeding becomes more and more voluntary, and less of a non-voluntary response to stimuli from the breast or bottle. This occurs in a full term infant around 6 weeks of age. This is important to note, as unsuccessful feeding in the first 6 weeks of life, can set the tone for developing eating patterns throughout life. By 4 months of age, most infants have gained fair head control and are able to remain in an upright position with support, and parents are beginning to introduce puréed foods. As they have grown, the anatomical structure of their jaws and tongues have dropped forward to support munching patterns. They also may open their mouth when a spoon is presented and are able to manage thin purees with minimal difficulties. The development of these patterns allow infants to be successful with thin and thick purees, meltables and soft foods such as banana and avocado. Between 7 and 9 months of age, infants are now moving into unsupported sitting, quadroped and crawling. This development supports jaw stability, breath support and fine motor development for self feeding skills. Infants at this age now begin to be able to successfully manage “lumpy” purees, bite and munch meltables and softer foods with assistance and the development of rotary chewing begins. The above skills are clearly noted during the 7-9 month age range. If these skills are missing, eating a larger variety of textures will become difficult. Rotary chewing is broken into stages. The first stage being diagonal rotary chewing, and the second being circular rotary chewing. 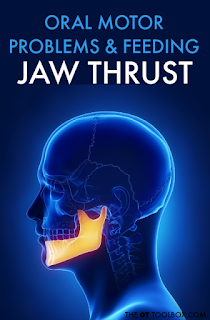 Diagonal rotary chewing is when the jaw moves across the midline in a diagonal pattern and comes back. This type of chewing often looks like an X from a frontal view. As the child develops, a circular rotary pattern emerges. In this pattern, the child’s jaws line up, slide across, jaws line up, and slide across again, looking like a circle from a frontal view. Rotary patterns begin emerging around 10 months of age. The child at this time is also developing dissociation of his head from his body. This supports increased independence with biting pieces of food, lateralization of a bolus across the midline, and decreased spillage from the lateral sides of the mouth. By 12 months of age, the child has developed the oral motor basics to support feeding. As time goes on, the child will practice these skills resulting in less messy eating and the ability to handle more challenging foods. At this age, a child is able to manage foods with juice, and chew and swallow firmer foods such as cheese, soft fruits, vegetables, pasta and some meats. 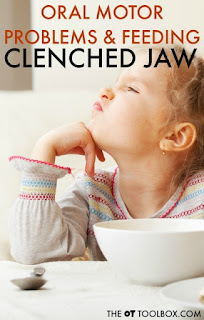 Between 16 and 36 months of age, the child continues to develop their jaw strength, management of a bolus, chewing with a closed mouth, sweeping of small pieces of food into a bolus, and chewing ‘harder’ textured foods such as raw vegetables and meat. A full circular rotary chew should also be developed at this time to support eating all varieties of foods. Oral motor skills play a large role in a child being a successful eater and having a positive experience with food. When a skill is missing, feeding becomes difficult and stressful for everyone involved. By assessing where the delay in skill is, new skills can be developed successfully, leading to an efficient eater. Read here about oral motor skills and the sensory components that play into picky eating and problematic feeding.